Henderson has developed wetsuit systems for all water rescue situations, for both military and civilian applications. Henderson has been the exclusive supplier of water rescue suits to the USCG for more then 20 years. These rescue suits have been proven during tens of thousands of hours of intense Search and Rescue operations. Every suit is hand crafted to exact specifications in Henderson's USA factory. All USCG water rescue suits are constructed from Henderson's exclusive Hyperstretch ® Thermoprene ® Wetsuit material. The increased elasticity of Hyperstretch has multiple benefits, including less muscle fatigue and greater range of motion when bending, squatting, kicking and reaching. This is one of the reasons Hyperstretch is used in Henderson's Rescue Swimmer and SPEC OPS/SAR Wetsuit lines, where freedom of movement and swimmer endurance are critical. Note: Special Order. These suits are made to order by Henderson (not stocked). As such, they are non-returnable. These wetsuits are internally lined with Henderson’s exclusive Fire Fleece lining. Fire Fleece lining is an ultra-high stretch, low pile, synthetic fleece which is incredibly comfortable. This comfort will enhance performance during extended deployment. Fire Fleece lining also contributes to the 300% stretch of the material making all land and water based movements nearly resistance-free. This significantly reduces the effort required to move in a wetsuit and significantly increases energy stores for thermal regulation during prolong exposure. Fire Fleece lining minimizes water transfer throughout the wetsuit resulting in maximum thermal conservation. All the seams on Fire Fleece 3, 5, and 7mm wetsuits are double glued and then blind stitched inside and out (most wetsuits are only sewn on one side). This provides longevity, confidence, and performance in the most demanding conditions. The exterior laminate is also pill-resistant. Pilling occurs when wetsuits are exposed to hook and loop style fasteners, non-slip swim platforms, BCD’s and other gear worn along with the wetsuit. No high stretch wetsuit is “pill proof”, but the Fire Fleece exterior will resist pilling and abrasion significantly better than other wetsuit laminates and will significantly increase replacement cycle times. The time proven, back zip entry design significantly accelerates the speed at which users can be in the wetsuit and ready to deploy. Rear zip entry configurations are well suited for use in confined spaces and tight quarters, like helicopter cabins or surface deployment vessels. The suits can be easily unzipped for comfort and quickly re-zipped prior to deployment. The Core Warmer is designed for maximum warmth and comfort and for use in a wide variety of SAR, Surface and Diving applications. This suit provides core body coverage, and is designed to be worn alone or as a layering garment under wetsuits or Dry suits. This Core Warmer is designed with flat hook & loop shoulder entry configuration. This entry design allows the suit to fit easily and comfortably under heavier thermal garments or overalls without bunching or snagging. Jumpsuits are available in three thicknesses for maximum warmth and comfort, and for use in a wide variety of SAR, Surface, and Diving applications. All these suits offer a rear zip entry configuration. This time proven entry design significantly accelerates the speed at which the user can be in the wetsuit and ready to deploy. Rear zip entry configuration is well suited for use in confined spaces and tight quarters like Helo cabins. Pill and abrasion-resistant nylon exterior. Get in, get out and get done with this high-performance rescue shorty. The use of Hyperstretch means this suit goes on easily and wears easily. It flexes with the body and thus helps minimize fatigue. Quality construction techniques, like flatlock stitching and a heavy duty back zip insure long suit life, and Henderson has added reflective Solas panels to the International Orange color for maximum visibility. Rescue pros will appreciate the warmth of this cap, but it's also a way for any diver to dramatically increase surface visibility. There's both a hook & loop patch for attaching a strobe and a set of highly reflective Solas panels for boosting viz day or night. The Gator Grip hook & loop chin strap securely anchors the cap so that it won't slide, even during active swimming. For nearly half a century, Henderson has had a reputation for making the best fitting and most comfortable hoods in the world. The secret is a contoured fit that does not become compressive over time. The fit on our caps and hoods has been refined over and over again. These refinements assure the satisfaction of the personnel who depend on these hoods to keep them warm and comfortable in extremely demanding situations. 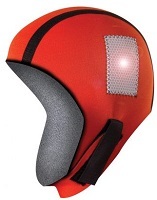 Hyperstretch neoprene allows for optimal flexibility and very little head squeeze. 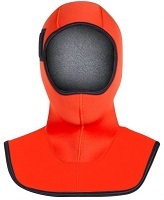 A dual density design, the combination of 5mm and 7mm thicknesses makes this hood a great choice for ice rescue / extreme cold waters when used with a drysuit. The hood is 7mm and the black portion contacting the neck is 5mm. International Orange color on head portion insures maximum visibility. The Hooded Vest is designed for maximum warmth and comfort and for use in a wide variety of SAR, Surface and Diving applications. This suit provides core body coverage and is designed to be worn as a layering garment under wetsuits. The Hooded Vest fits easily and comfortably under heavier wetsuits of varying densities, and is designed so it will not bunch or ride up while in use. The Henderson wetsuit size charts are provided as a rough guide to fitting. HEIGHT 5'6" 5'8" 5'10" 5'11" 6' 6'3" 6'1" 6'4" 6'2" 6'2"
INSEAM 26" 27" 28" 28.5" 29" 31" 30" 32" 31" 31"
TORSO 26" 27" 28" 28.5" 29" 31" 30" 32" 31" 31"